I’m off to the 2011 Geneva Motor Show rather early tomorrow morning. There’ll be lots of new metal to admire but the car I’m keenest to have a close peer and poke at is the Mini Rocketman. Yes it’s a daft name – no doubt meant to echo Clubman and Countryman, but instead it puts me in mind of a pompous, balding, has-been rock star. No doubt thoughts of Elton John were triggered during naming brainstorming sessions by the new car’s face, which seems to be wearing a particularly ostentatious pair of specs. The car is a show-floor concept with details that clearly won’t make production. The carbon-fibre parallelogram door hinges are unlikely to grace a real car, nor the suitcase-handle rear lamps, or for that matter the glass roof with Union-flag segments mirroring the underlying carbon cross-beams. But maybe the push-me-pull-you styling will survive, with a boot aperture that repeats the shape of the front grille, sharp-creased giant arches and over-inflated wings. If previous Mini concepts are a guide, the overall shape and proportions will be a close indicator of what’s to come from a new and genuinely mini Mini that will eventually reach showrooms. And it is wee. The Rocketman is a 3+1-seater measuring 3.3 metres from snout to tail. That’s about a foot longer than a Toyota iQ, but a handspan shorter than an Aygo. Compact, then, but not excessively so. Newly installed Mini design chief Anders Warming has been pictured posing with the Rocketman, but the car is almost certainly not his work. He’s only been in the job since December and I’m informed by style pundits much more knowledgeable than I that a few short months aren’t long enough to do much more than sharpen a set of pencils, much less design a whole car. 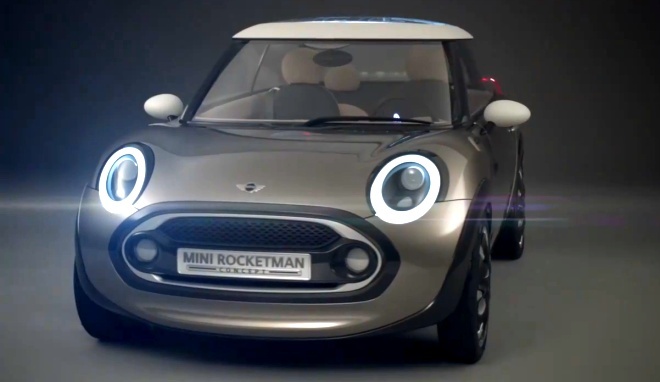 So the Rocketman may well be the Mini swan song of former design boss Gert Hildebrand. I heard Hildebrand give a talk about Mini’s design language early last year, and he made a revealing slip of the tongue. Instead of calling the 1959 car the original Mini, or some similar PR-approved term, he called it “the real Mini”. We’ve got used to thinking of the current hatch as the proper Mini – the measure against which the convertible, Clubman and Countryman are reckoned. Perhaps that’s about to change. If the pocket-sized Rocketman does eventually reach production, I think it ought to qualify as the new “real” Mini.